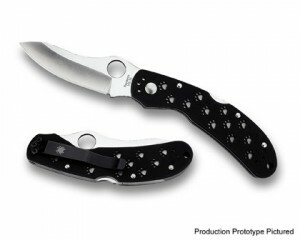 Description: The Spyderco Ocelot is modeled by Tim Wegner and resembles his other knives designed for Spyderco knives, and leans towards a hunting and dressing knife like the Spyderco Impala which it replaced in 2005. The knife features paw prints on the handle to improve traction. This entry was posted on Wednesday, October 7th, 2009 at 10:53 pm	and is filed under 3" to 4" Knives, Designer - Tim Wegner, Handles - G10, Lock - Liner Lock, Manufactured - Japan, Steel - VG-10, Type - Folding Knife, Type - Hunting Knife. You can follow any responses to this entry through the RSS 2.0 feed. You can leave a response, or trackback from your own site. Why do you say that the Ocelot is a Sal Glesser design when on the back of my blade it says Tim Wegner design. If this is so then Wegner should be credited with at least three designs (the fourth would be the mouse but I understand because it was never a catalogue/production knife) and remove one of Sal’s. I am not a blade tech user. 95% of my 174 knives are Spyderco. Also why don’t you put the older Diver series up. Like the pro diver and prediver? Thanks for the heads up – mistake on my part!